Artola is an original 1870s Linen Warehouse which is being completely re-built behind its red brick facade to provide High Quality Grade A Offices over ground and four upper floors The new development will deliver up to c. 18,285 sq ft of Grade A open plan offices with a traditional mix of brick, metal and wood finishes”. Nos 91-93 are new. J3474 : Nos 91-97 Victoria Street, Belfast - April 2015(3) shows the previous building. 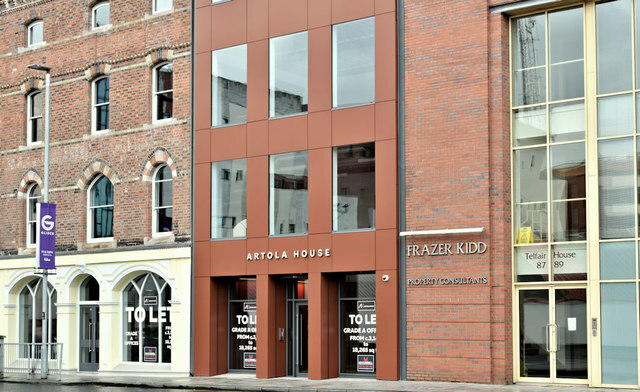 Two adjacent buildings, between Upper Church Lane and Victoria Street with the following planning permission (8 December 2015) “LA04/2015/0076/F Proposed refurbishment and roofline alterations of existing office building at 95-97 Victoria Street, Belfast (Known as Artola House) and proposed demolition of existing office building at 91-93 Victoria Street and construction of new office building 91-97 Victoria Street Belfast BT1”. The photographs submitted by me appear as a matter of geographical and historical record only. I have no connection with any of the parties involved in the development and cannot enter into correspondence.